We provide strategic concepts and other organizing tools to help equalize the imbalance of power between those who possess far too much power and abuse it, and those who suffer from that abuse. Much of our work has been on behalf of unions in the private and public sectors to advance the interests of working people and to help them obtain contracts providing fair wages, benefits, work rules, equality and safe workplaces. Organizations outside the labor movement also have benefited from working with us. For example, our strategies, literature, labor contacts and public outreach played crucial roles in winning struggles to keep oil companies out of the Arctic National Wildlife Refuge (ANWR) and to save the free-speech Pacifica Radio network from a corporate takeover. Businesses constantly tap into the immense power of information technology and use it against unions and other groups fighting for justice. But how many of these unions and groups know how to gather the information they need, how to analyze it and how to make use of it? CCI's researchers won't waste your time and weigh you down with stacks of confusing and unnecessary information; we know what to look for, how to get it and how to provide the strategic analysis needed to fight smart and win. Corporate/financial/political power analysis: We use a unique method to analyze corporate and institutional power structures and to identify their vulnerabilities and weakest links. Strategy development: In collective bargaining these days, management often becomes completely intransigent and negotiations turn into confrontations. All too often, traditional tactics prove inadequate. Corporations and governments have devised new strategies to defeat strikes and organizing drives in efforts to crush labor; therefore, unions and other groupsneed to learn about the most advanced Corporate Campaign concepts to help them develop their own counter-strategies and tactics. CCI is widely recognized as the leader in advancing new ideas to help unions beat back management aggression. Whether you need to mount an international campaign or achieve a specific local objective, CCI can help you develop and execute a winning strategy. Conceptualize, write and design high impact literature: CCI offers the full range of services needed to provide you with hard-hitting and dynamic literature. Working closely with your organization, our writers and designers create effective flyers, posters, brochures, stickers, ads and other materials that help communicate your message. We take the most complex issues and explain them in eye-catching, easy-to-understand literature. Combined with CCI's outreach strategies and capabilities, this literature becomes a powerful organizing and public relations tool for you. Graphic design, artwork, photography & website development: With CCI, you work with top-notch graphic designers, illustrators, photographers and union printers. Generate favorable media coverage: An effective media and public relations presence is always an important factor in achieving your goals. CCI has helped generate millions of dollars worth of publicity without incurring the expense of paid advertising. Media work involves far more than sending out press releases. Generating positive media coverage is a result of becoming newsworthy and establishing mutually respectful relationships with reporters, columnists and editors. You also need the right spin on the story; a clear, succinct way to communicate your message, and up-to-date and targeted lists of media contacts. In short, we can help you develop a well-planned and well-executed media strategy. Mobilizing and organizing: Solidarity and strategic planning are crucial, but not sufficient, to achieving success. To win, you need an organizational structure to implement the strategy and to direct people's energies. Staff, membership and family involvement: Within any union's membership and staff there's a wealth of knowledge, skills, and imagination that can be a powerful force — if organized properly. CCI staff has years of experience helping unions organize their members, families and staff into a powerful political and economic force. Broad-based coalition building: CCI helps clients build support from other organizations and people in and out of the labor movement. We have a vast network of contacts with union officials at all levels as well as individuals and organizations sympathetic to labor causes. We can help unions and other organizations build alliances and form powerful coalitions. Mass public outreach & direct action: In certain tough fights, where direct action is needed, CCI staff, who are veterans of many struggles, can help you carry out public activities that raise awareness and ramp up the pressure on your adversaries. These activities can include: mass literature distribution, door-to-door canvassing, demonstrations and rallies, shareholder protests, consumer boycotts and nonviolent civil disobedience. For example, an effective shareholder action serves as both an excellent organizing tool and a warning to top executives, board members, institutional shareholders, creditors and analysts that they will all be held accountable and will pay a heavy price unless justice prevails. How do we define a Corporate Campaign? You cannot confront powerful corporations and other adversaries and expect to gain any meaningful concessions or achieve a just result unless you are backed by a significant force of power. A Corporate Campaign is not simply a campaign against a company. A real Corporate Campaign as we define it, is a mechanism to confront power with power. A Corporate Campaign can best be viewed as a multidimensional campaign that attacks an adversary from every conceivable angle, creating relentless pressure on multiple individual and institutional targets. A developing Corporate Campaign strategy can be viewed as a spectrum with a beginning point "A" and an end point "Z." Point "Z" is defined as total defeat of your adversary. Corporate Campaign strategists know that if they can proceed from beginning point "A" toward "Z," somewhere between "A" and "Z" there is a breaking point or a point of fair compromise. There are two key problems you need to solve in order to wage a successful Corporate Campaign. The first is analytical and conceptual: can a multidimensional strategy be mapped out that you know will win? With the proper specialized corporate/financial/political power analysis, the answer is Yes! The second problem deals with organization and execution. 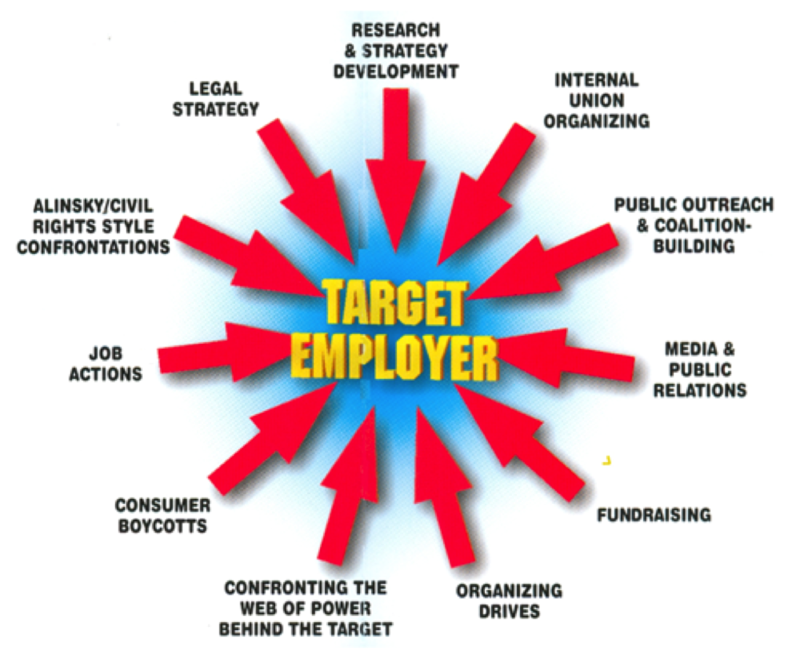 Can your organization mobilize and channel those economic and political forces necessary to bring escalating pressure on individual and institutional targets, causing your adversary to give in? Again, with the proper strategy and guidance the answer is Yes! Within each point on the chart there are many different elements and types of strategic thinking. For example, when should a labor union try to increase its bargaining leverage with the threat of a strike, and when should it not? What are the best possible strategies to avoid a strike or lockout? If a lockout or strike occurs, how can it be kept as short as possible? To answer these questions, one must understand how to pit your organization's strengths against your adversaries' weaknesses, how to turn negative situations into positive ones, how to maximize psychological pressure and how to break down your adversaries' power into manageable units that can be challenged, attacked, divided and conquered.